Posted August 9, 2017 by Alec Smart & filed under City News. On Thursday 2 August, a public forum was held at Vivo Café on George Street in the city, for people adversely affected by Sydney’s light rail construction. Radio 2GB’s Alan Jones addressed the meeting, attended by over 100 business owners and residents who live and trade along the new CBD and South East Light Rail Route. Hosted by cafe owner Councillor Angela Vithoulkas, whose establishment is one of those negatively impacted by the light rail project, the purpose of the forum was to air and discuss multiple grievances. The forum was also attended by Jody McKay, Shadow Transport Minister; Councillor Linda Scott from the City of Sydney; and Randwick City Councillor and former Mayor, Tony Bowen. “The reason we called this meeting was because the NSW State Government has consistently said they’ve never heard anyone complain,” Cllr Vithoulkas said. “I have had two more forums before this and the NSW Business Commissioner was present at both to take details of people’s stories and take them to the NSW Cabinet. I don’t know if that happened, because they refuse to tell me. The forum heard numerous accounts from shop and restaurant owners who have ceased trading or are facing possible closure due to a variety of issues linked to the light rail construction work. These grievances include: barricades inhibiting access to premises, excessive noise, road and foot traffic diverted away from retail areas, and significant financial losses. Several claimed that Transport for NSW repeatedly said that the shortfall in customers during the construction phase would be offset by a significant increase once the light rail is operating. The trouble is: they have to endure it for four years. Several residents whose homes adjoin the light rail construction complained of dust, fumes, noise, bright lights on at all hours, restricted movement for people with disabilities, heavy machinery operated overnight and long deviations around work sites. Among the plaintiffs who addressed the forum was Randwick resident Andrew, whose home fronts the construction work on Anzac Parade. “They often work overnight until 4am, stop, then start again at 7am. I’ve documented it and taken photographs. I bought a noise level meter and recorded over 100 decibels in my living room from jackhammers – equivalent to standing a metre away from a lawnmower. Amelia, owner of a café in Surrey Hills that she managed for seven years, had to close her business when the light rail construction work reduced customers to an unsustainable level. “We had 1200-1500 people coming through our doors every week, most of those locals and regulars. As soon as the contractors put the barricades up, we were down 40% in the first week. Second week was 50%. And when I was told that all our outdoor seating would be taken away the week after, we had to let go 12 members of staff. Construction on the 12km CBD and South East Light Rail route, begun in October 2015, is being staged across 31 construction zones. The project will result in a light rail service from Circular Quay along George Street (with a newly pedestrianized section between Hunter and Bathurst Streets) and through Surrey Hills to Moore Park, where it diverts into two forks to Kingsford via Anzac Parade and Randwick via Alison Road and High Street. On completion there will be 20 platforms, including interchanges at ferry, bus and railway stations. However, completion is not expected until 2019. It was revealed in July this year that these new trams – a fleet of sixty Citadis X05 trams from France, each 67 metres in length – the first of which arrived on August 1, are incompatible with the existing inner-west line between Ultimo and Dulwich Hill. So passengers travelling from the inner west to Moore Park for sporting events and concerts will have to change trams at Central Railway Station to continue their journey. One of the two key companies managing the light rail consortium, Alstom, has a very shady reputation. On 13 November 2015, Alstom S.A., the French transportation and power company, was sentenced to pay a fine of $772,290,000 – the largest-ever criminal foreign bribery fine in history – to settle charges with the U.S. Justice Department alleging the company bribed government officials to win business contracts around the world. On 22 December 2014, Alstom pleaded guilty to falsifying its books and records and failing to implement adequate internal controls. In addition, its subsidiaries pleaded guilty to conspiracy to violate anti-bribery provisions and admitted they paid bribes to government officials, falsified books and records and conspired to cover them up in connection with transportation and power projects for government-owned entities around the world, including Saudi Arabia, Egypt, the Bahamas, Taiwan, and Indonesia. Cllr Vithoulkas announced that a legal action seeking financial compensation from the NSW Govt. would be launched. 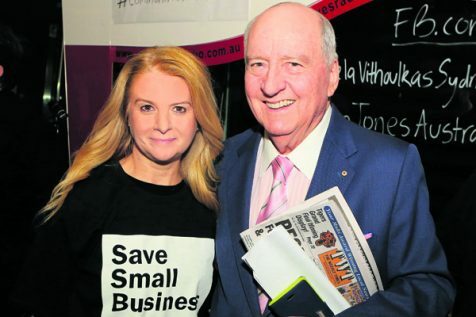 “We are launching the Save Small Businesses and Communities Fighting Fund,” she confirmed, “because I do intend to go forward with a class action. We are looking for a legal fund but the initial situation is going to cost about $50,000 to kick it off. T-shirts are being sold as part of the fundraising campaign. “We have been living in a construction zone for two years, with two more to go. “The class action is down the track,” said Alan Jones, “those legal mechanisms are awfully complicated. Meantime, there has to be a commitment by the NSW Government to appropriately compensate people that have been damaged irreparably. “They need to form a panel to hear representations. The people affected can present their case with their bank or accountant, so that no one will cheat the system. This would not run into a lot of money. The goodwill would be enormous.